My son’s preschool puts on an auction each year. Families are asked to contribute a useful service or something handmade. This year, I’m donating a custom pet portrait. I decided to go for small pencil drawings. These two are samples I’ll have on display so folks can get a good idea of what they’re bidding for. I haven’t had anything up in my Etsy shop for a few months, but I’ll add this custom pet portrait to it. People sure do love their pets. And who doesn’t love a dog in glasses? I walk by this house frequently as it is one of the first houses on the street leading into the fancy neighborhood. The roof is aluminum and the shutters and windows are blue. It stands out on a street of extravagant craftsmans and tudors. I only had time to do the ink while there and I scanned it before adding color at home. The watercolor brought out the cherry blossoms, but I like it either way. You know what takes longer than a half dozen detailed graphite leaves? Hundreds of roof tiles. Maybe by next Friday I’ll have this completed. This is a house in the Eastmoreland neighborhood of Portland. Eastmoreland is fancy and close by so I often walk my dog around it. Something about this particular house always grabs my attention. It’s a different style than most in the neighborhood and the blue shutters and red door always stand out against the white stucco and silver roof, even on the grayest days. 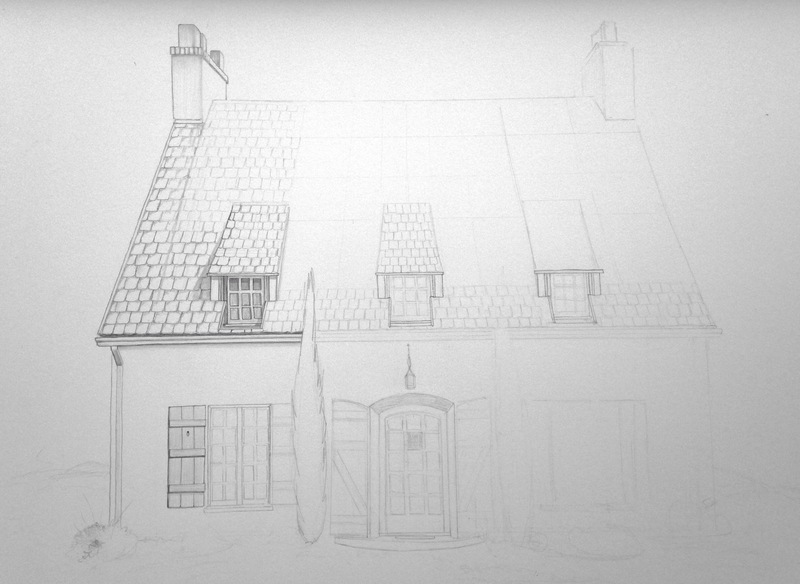 I initially planned to color just the shutters, but I’m leaning towards coloring just the front door now. I love the look of graphite, but you can’t erase your guidelines when your final lines are also in pencil. I’m learning this is problematic for geometric/architectural subjects as opposed to organic subjects which can be believably drawn inaccurately. I’m not yet convinced that this is a good medium for buildings, but I think it’ll look killer… if I don’t totally wreck it. Lemon Branch, watercolor, graphite & colored pencil on bristol, 14 in. x 11 in. 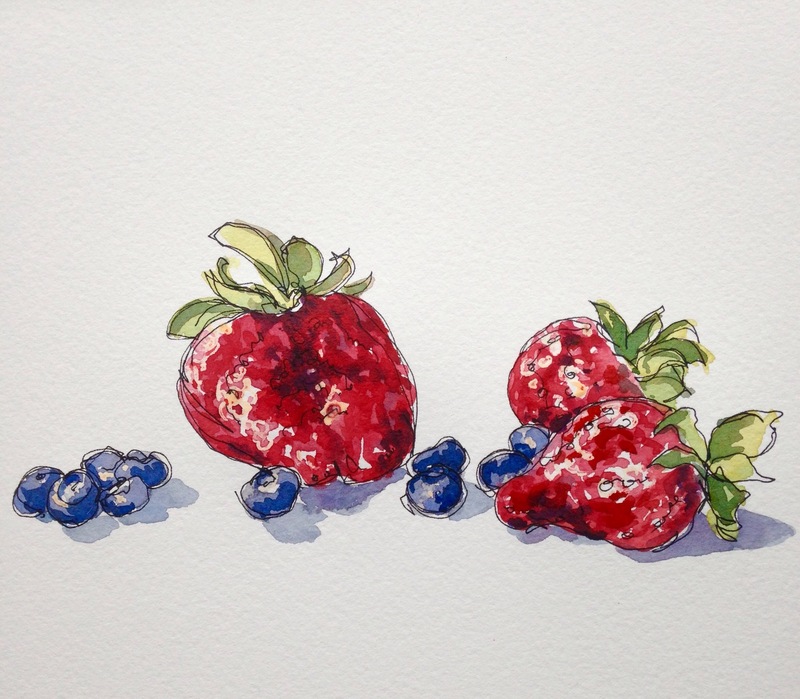 Berries, ink and watercolor, 11 x 6 in. My littler boy used to get a rash from strawberries. We stayed away from them for two long strawberry seasons, but we tested out the allergy this week. I figured it would eventually disappear and, to the whole family’s delight, it has! In celebration, I sketched my favorite fruit salad ingredients. Mmm. Family Ride, ink and watercolor in Stillman & Birn Zeta sketchbook, 11 x 8.5 in. We had an excellent weekend of bike rides, donuts, sushi, and kids-staying-with-grandparents. Somehow, though, I only got a couple quick sketches in. This is our family bike set up from early in the morning while the kids played ‘Bank Robber’ at an otherwise deserted playground. This was just after second breakfast at Blue Star donuts, so the sugar energy was high. I should’ve sketched the donut, but I know that if I take my hands off my scrumptious treat for one moment, it will be snatched right off my napkin with such stealth that before my eyelids can lift up to zero in on the thief, my kid will be licking his fingers. Lime Branch, watercolor, graphite and colored pencil on bristol, 14 in. x 11 in. There was no Watercolor Wednesday this week because of [excuses]. I did, however, finish the second of three citrus branch paintings. I’ve been making these while watching episodes of Justified, so looking at them makes me talk in a Kentucky accent. On Saturday morning, I loaded up my bike basket with art supplies and rode over the Tilikum Crossing down to the South Waterfront. There, I met the Portland Urban Sketchers for this month’s sketchcrawl. The intention was to draw everyone’s favorite new bridge, the shiny white Tilikum, but a very short ride from our meeting place was a sunny viewpoint showing the full expanse of the Ross Island Bridge- Portland’s most underrated of bridges. From the top, the RIB is not very fancy. Pedestrian traffic is not allowed or is at least dangerous and, while car passengers can enjoy striking views of the city, drivers best keep their eyes on the road to avoid head-on collisions or a lengthy drop down to the Willamette. Below the road, though, the bridge is as pretty as any of the other bridges in town. The steel supports are going to be repainted this year. In real life, the bridge is a much lighter faded color, but this here is me urging the city to go for a nice bright green. As I finished up the ink of this painting, the sun shone and the air got warm enough for me to take off my coat. A sailboat floated by with 4 pirates on deck singing, “What will we do with a drunken sailor? What will we do with a drunken sailor? What will we do with a drunken sailor, early in the morning?” It was a bit late to be considered early in the morning, but by the sounds of it they had the drunken sailor part just right. I finished this painting! It may not look like it, but this took many hours. I think 3 or four nights of 2-3 hours each. I always mean to- but never ever remember to- keep track of how many actual hours it takes to make anything. But I’m guessing 10ish hours here? That seems ridiculously high. On the plus side, shading is somewhat mindless/meditative. And I like how it turned out. That’s always a nice after spending a boatload of time on something! I’m planning to continue with this theme. Pencil drawing with a watercolor element. I can imagine many different subjects for which this this could work well. Including my favorite subject, architecture. And portraits, too. But my productivity is sure to go down the toilette with this method. I’ll have to do unrelated 10-minute mini drawings every morning just to keep my Instagram feed fed. I dragged myself out of the house last night and went to Craft Night. I had a real hankering for putting on my couch pants and watching Murder She Wrote all night but I decided to ignore myself and risk uncomfortable conversation for the possible benefit of normal social interaction. I’m glad I did, because it was fun and I left one of my paintings to be hung at Craft Night’s current show at Bar Carlo. I’ve never had anything in a show before. No big deal, but fun. I put up my Royal Typewriter from a couple weeks back. It’s in there with a whole bunch of terrific stuff from the others. If you’d like to follow this blog, see the Connect page.